Shocker. The Lakers are once again taking the absolute laziest route possible to making a monster decision. Hey, Ty Lue coached LeBron in Cleveland and they won a championship and LeBron would presumably sign off on him and perhaps, if we’re lucky, even play a tiny bit of defense for him. Let’s get it done! This isn’t really a knock on Ty Lue, although to suggest that the Cavs winning that 2016 championship — which, even with the best player in the world joined by a healthy Kyrie Irving and Kevin Love still only happened because of a leisurely stroll through the tissue-soft Eastern Conference and a perfect storm of circumstances in the Finals — is a stretch. So again, let’s not get lost in the verbiage. Lue is the leading candidate for the job because the Lakers think it’s the easiest thing to do given his history with LeBron. That doesn’t mean it can’t work out. Or that Lue will ultimately get the job. It just means the process is lazy. Again. Remember when the Lakers were going through this same process when they parted ways with Mitch Kupchak? All the talk was about how the Lakers, despite their recent foray through relative irrelevancy, were still THE LAKERS and could still get anyone that they wanted. What did they do? The absolute laziest thing imaginable. Bring Magic Johnson back in. Give him the power to make any and all roster decisions. He has absolutely zero track record of successfully managing such a job, but the people will love it! Listen, Magic did the Lakers a favor when he, too, did the laziest thing imaginable and bounced on them in an impromptu press conference without even telling his boss. The simple fact is that he wasn’t very good at his job. He signed LeBron, through very little doing of his own, and then figured everything else would just sort of fall into place. And when it didn’t, and he went from beloved figure to criticized team president — well, that was all folks. Jeanie Buss never would’ve “parted ways” with Magic Johnson against his wishes as any other owner would do with any other under-performing and frankly under-qualified employee. 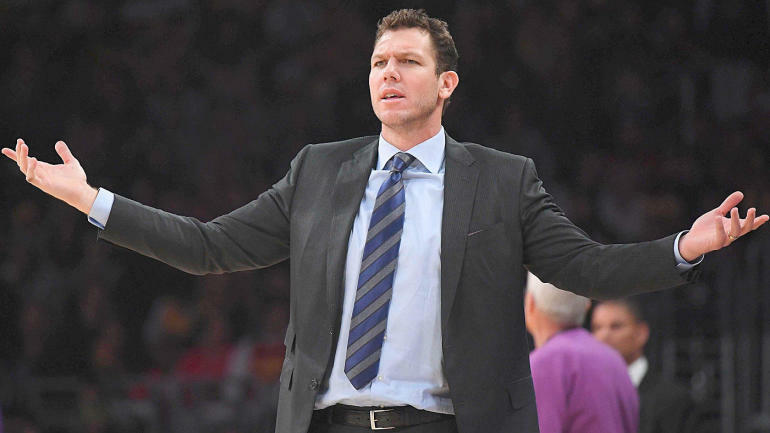 So the Lakers got lucky when he left on his own, and now, in their first chance to reestablish some semblance of organizational authority, they’re reportedly turning the coaching-search reins over to … you guessed it, another guy with absolutely no track record of being good at this job. Pelinka will run the Lakers coaching search. As @wojespn reported Ty Lue is one of the leading candidates. The expectation is they will talk to others, too, though. The are empowering all the wrong people as they continue to ask all the wrong questions. It shouldn’t be: What can we do that will make LeBron the happiest? It should be: What can we do that will be best for the Lakers long term? In fairness, the Lakers did kind of throw all long-term considerations out the window when they signed LeBron in the first place. Again, Magic tried to say that wasn’t the case, that they were going to remain patient and all that noise, but that was never true. When the Lakers got off to a bad start largely because of Magic’s ill-conceived roster and LeBron James‘ absolute disinterest in playing defense, Walton was the scapegoat. When things never really got better because of injuries, the unrelenting Western Conference and a lack of roster upgrades, Walton was the scapegoat. On Friday, they made him the scapegoat once more. Listen, maybe Walton was never going to be the right guy for the Lakers once they signed LeBron. Different coaches are right for teams on different timelines. Mark Jackson was great for the Warriors when they only had to go from bad to good. He wasn’t the right guy to take them from good to great. The Lakers are trying to skip the good part and just go from bad to great. That kind of expedited progression isn’t about the coach. It’s about the roster. The Lakers are not in a terrible position in that regard. In fact, they’re in a pretty good one. They have LeBron. They have max-contract cap space. They have a good, and perhaps really good, young crop of players. Depending on what happens with Boston’s presumed offer, they could still deal for Anthony Davis. Plenty of teams would love to be in that position. We’ll see what Pelinka, or whoever else they bring in to contribute to such decisions, can do with it. As for Walton, he’ll catch on somewhere. The Kings are already reportedly making their play. Earlier this season, a league source told CBS Sports that Walton, before LeBron signed with the Lakers, was excited about the progress the team had made and was hopeful that they would let that continue to develop and not “get ahead of themselves.” Signing LeBron James is the definition of getting ahead of yourself. It doesn’t mean you don’t sign Lebron if you have the chance, but once the Lakers did so, they put themselves on contradictory timelines — half the team still needing to develop, half the team ready, at least according to their age, to win now. Walton got lost somewhere in the middle. And wound up with all the blame.